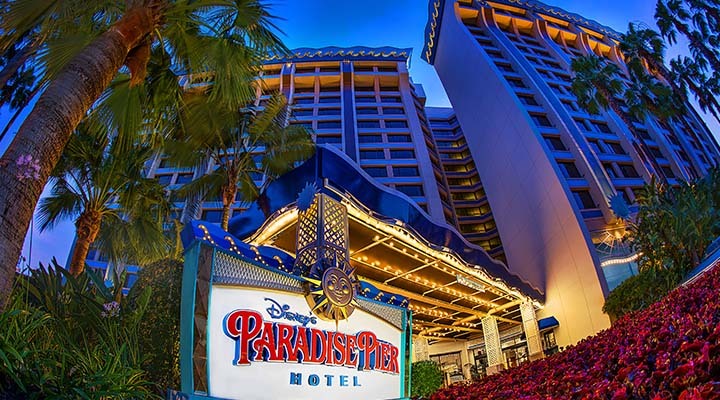 At DISNEY'S PARADISE PIER® Hotel, located across from the DISNEY CALIFORNIA ADVENTURE® Park, you’re guaranteed an unforgettable stay. Soak up the sun and fun with their cheery beach and boardwalk theme. 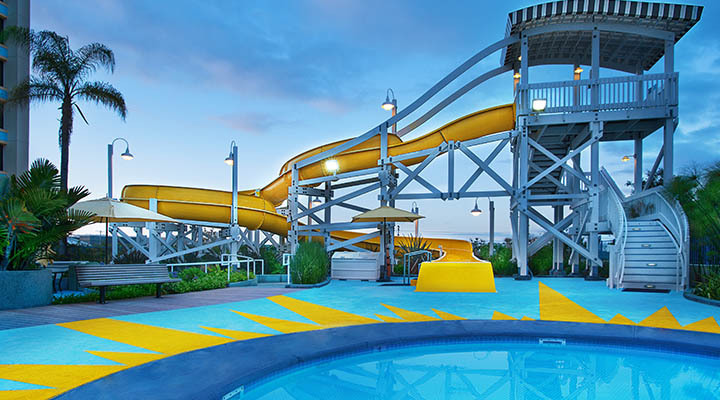 Check out the roller coaster inspired water slide at the scenic rooftop swimming pool. Be sure to make reservations at the on-site PCH Grill for Donald Duck's Seaside Breakfast where you can dine with Donald, Daisy, Stitch and more Disney friends. For the price I paid for this hotel I would think that the rooms would be a little nicer the beds be alot softer and you would expect the rooms to be clean. Very very very disappointed in the way the rooms was cleaned. For that matter they wasn't cleaned. We found clothes in our room left from the last guests that stayed there. The floors were not vacuumed. The bathroom was not cleaned, the bathroom mirrors had words wrote on them proving that they had not been cleaned. Not what you really want to read stepping out of the shower. The bathroom floors were gross.I don't think that they even thought about cleaning them. Peoples trash from the last stay on the floor in the bathroom. Not pleased at all with my stay.. I would recommend looking somewhere else to stay. For the price you pay for this Hotel you would think that it would be a lot nicer. This was a very nice Hotel, everyone was friendly, accommodating and helpful. From the moment we went to the front desk to when we left. The room was clean, comfortable. We checked in early and when the room was ready they texted us. This was our first time staying at Disney's Pier Hotel. While I say on-campus, it is officially across the street and to the back of the Grand California Adventure Hotel. You walk across the street and walk through the Grand to get into the parks. It is super convenient to the California Park. You can get scanned in at the hotel. This entrance lets you out right near the Grizzly River Run ride. If you go the Disneyland route, you still have to check in at the front gates. 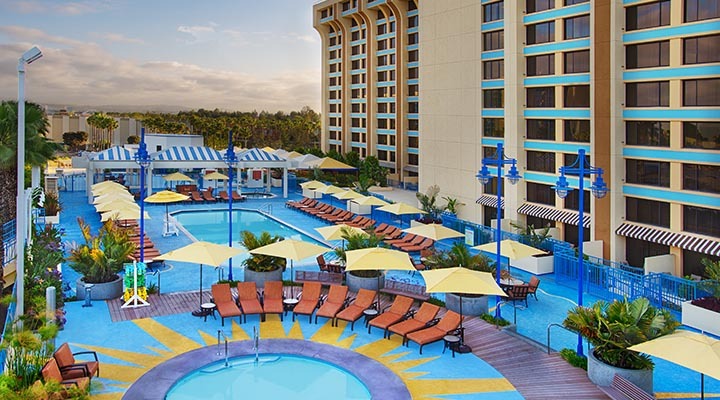 The hotel is everything you ask from a Disney hotel, but at a portion of the cost of the other on-campus hotels. 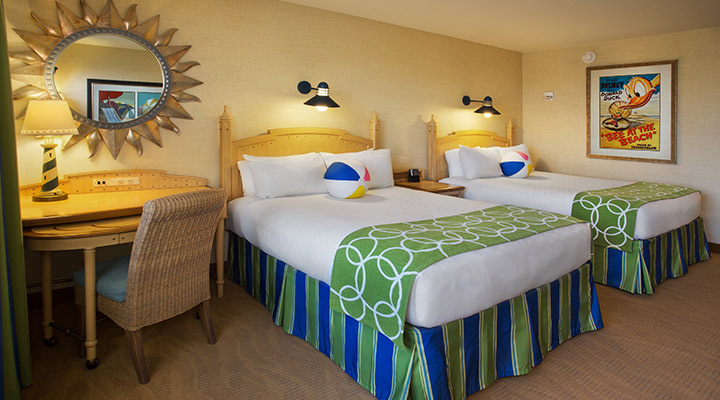 The hotel has a beach theme, but it still shows enough Disney decor to keep the die hard Disney fans happy. The customer service was great. The gym facilities were just as wonderful. The character breakfast food was not as nice as the other options, but this is the only place to see Stitch in Disneyland. This was the highlight of my daughter's trip. She loves Stitch! Great Room, Very Slow elevators. Things I loved: -The Room on the 13th floor with the view of California Adventure -The private entrance to California Adventure from inside The Grand Californian -The selection in the gift shop -The Magic Morning access to get into the park an hour early for Disney Hotel guests Things I liked: -The on-site self service laundry -The character breakfast. Good food, convenient, but very pricey. Things that need improvement: -The Elevators! It was really a pain waiting on the super slow, very packed elevators. Especially after closing hours of the parks when all the guests flood in. I waited over 15 minutes in line to get to the elevator! I had less wait time on some rides in the park; Unacceptable! This was the issue I had when I stayed here in 2012, in 4 years there is no improvement here; that is a major problem. -The prices and selection in the cafe leave a lot to be desired. No way was I going to pay almost $4 for a small bag of Dorritos that I can get in a grocery store for .99 cents. This was a nice hotel but not worth the price we paid. It is way overpriced. We got nothing extra and even had to pay for parking.. That should be included. I would never stay here again or any other Disney Hotel unless the prices were cheaper. Mr. Walt Disney would be very disappoited to know what it costs to go to Disneyland. My family and I did enjoy the parks and had a good time. This was our first time staying at Disney's Pier hotel. We really loved the early entry and being able to use the private entry at the Grand Californian hotel. 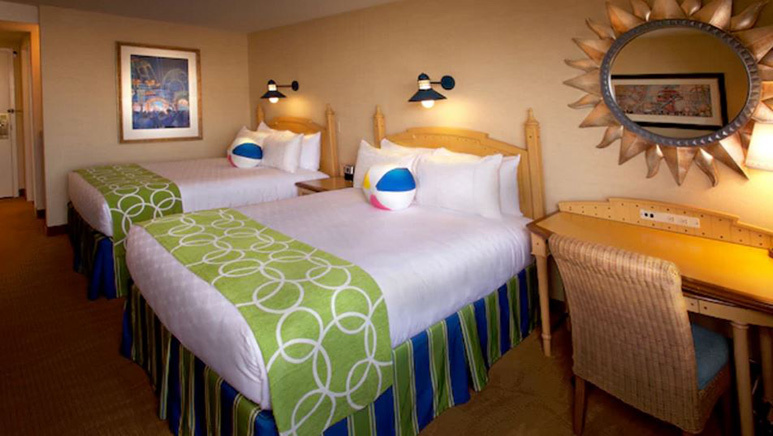 The rooms are fun and our kids loved the beach ball throw pillows. It was nice to have the little couch for some extra room.We just had a great time and would stay here again.